Summary: This is the perfect winter walk for much of it is done on well drained paths. 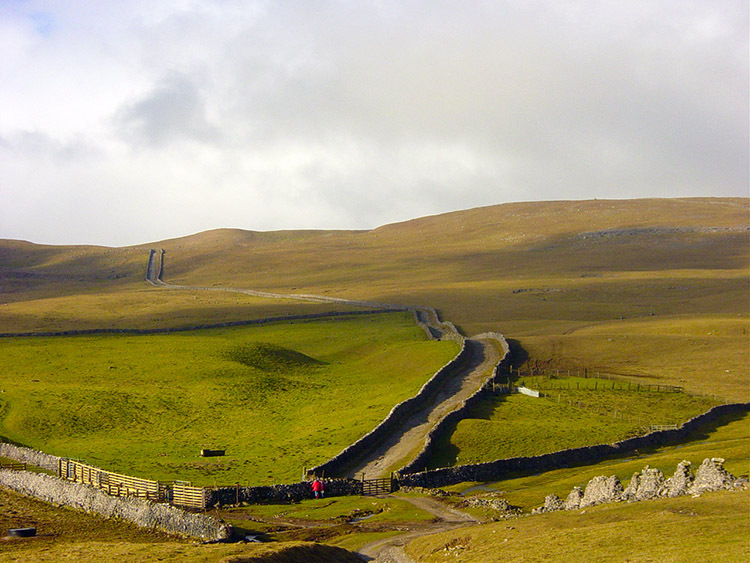 The first 5 miles from Kilnsey to Malham Tarn follows the noted Mastiles Lane Drovers Road which has been used since before Roman times as there is the site of a Roman marching camp on the drove road. At the end of the road Malham Tarn is reached. 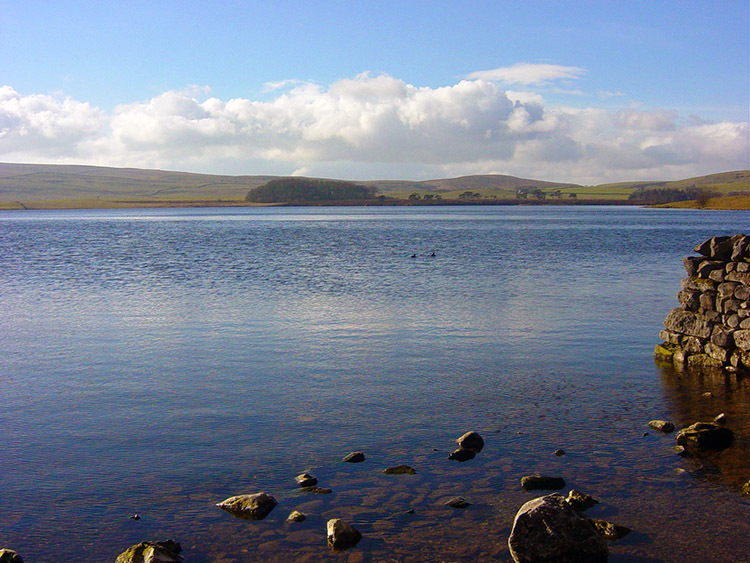 A popular Yorkshire Dales attraction, Malham Tarn is 375 metres above sea level and a relaxing place to be. 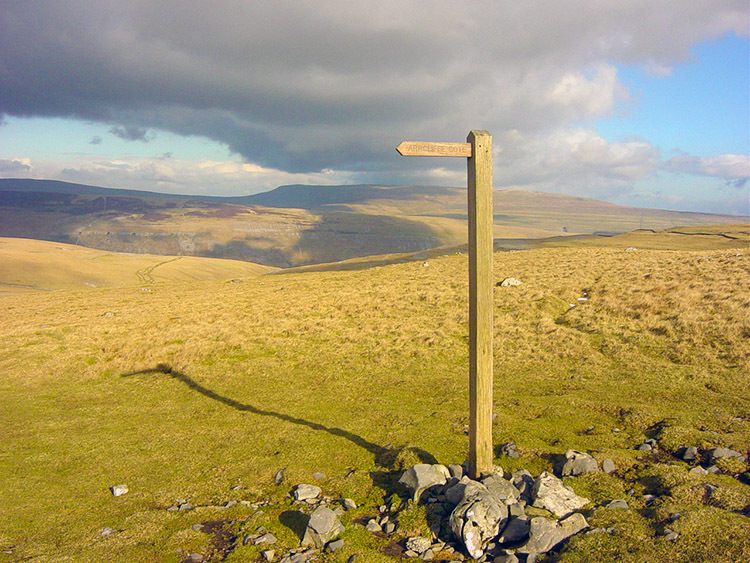 After enjoying the surroundings of the tarn the walk leaves to cross classic dales fells over High Cote Moor. 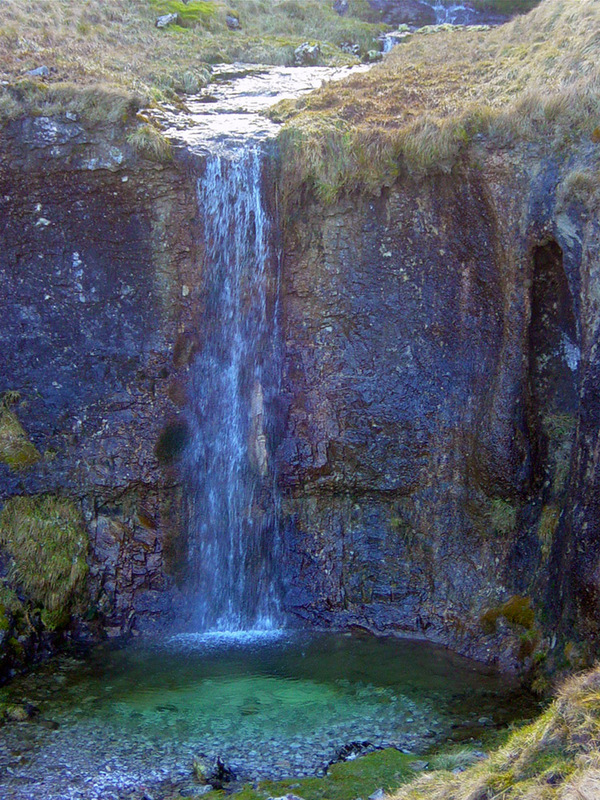 Look out for spectacular hidden waterfalls at Cote Gill before descending to Arncliffe Cote. 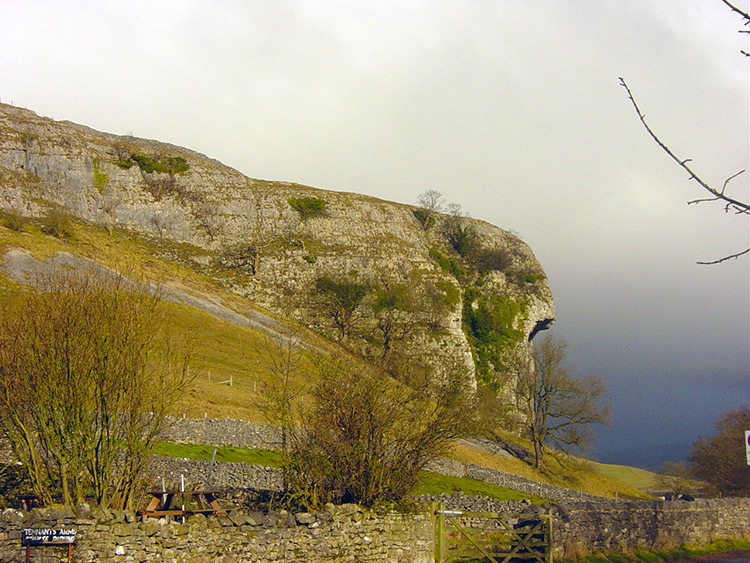 Then follow quiet roads to Kilnsey and walk closely past the famous Kilnsey Crag. 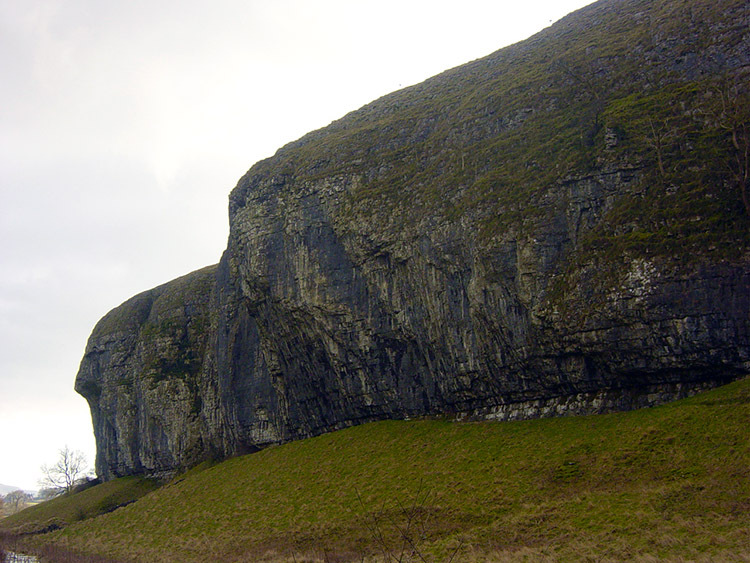 The Crag, popular with rock climbers will attract your eyes. It is an imposing finish to a great walk. The weather in January and early February of 2005 had not been bad. Winters seem to be getting warmer, that's for sure, but the moderating winter climate does seem to cause more cloud so it was the sight of waking up to a rare sunny day that fired me off from my office lethargy into the Yorkshire Dales to do this superb winter walk. And a perfect winter walk it is too for much of the walking is done on good ground and even the fell walking is limestone with excellent drainage. My boots were perfectly dry when I finished this classic. That was a joy. The walk is a trip back into time too for the first five and a half miles is spent following Mastiles Lane. 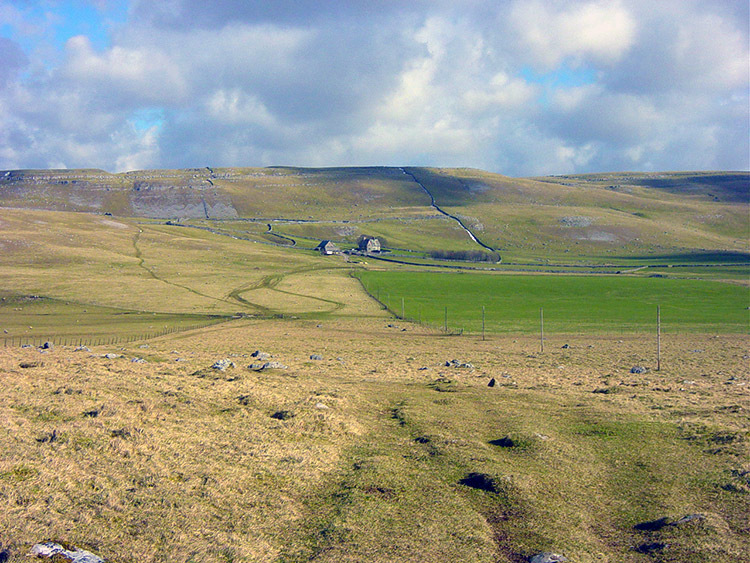 This drovers road has a long history of at least 2,000 years for there is the site of a Roman Marching Camp along the road between Kilnsey and Malham Tarn. Since the Roman occupation it has been extensively used for marching sheep, cattle, packhorses and groups of travelling merchants. It was one of the most noted monastic routes in medieval times with much of the surrounding land owned by Fountains Abbey. After the monasteries faded in the 18th century Mastiles Lane became an important droving route for cattle being brought south from Scotland. Now fell walkers march in place of the cattle. 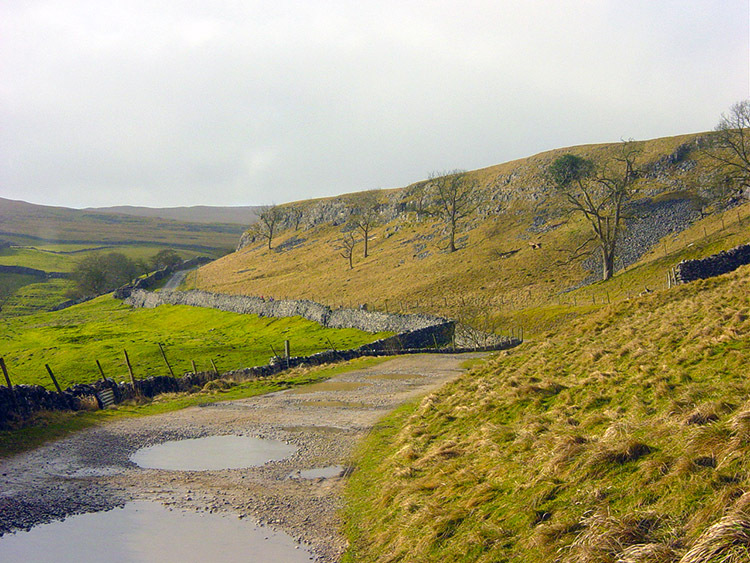 Mastiles Lane is a superb track as it winds its way through excellent Yorkshire Dales countryside. You must walk it. 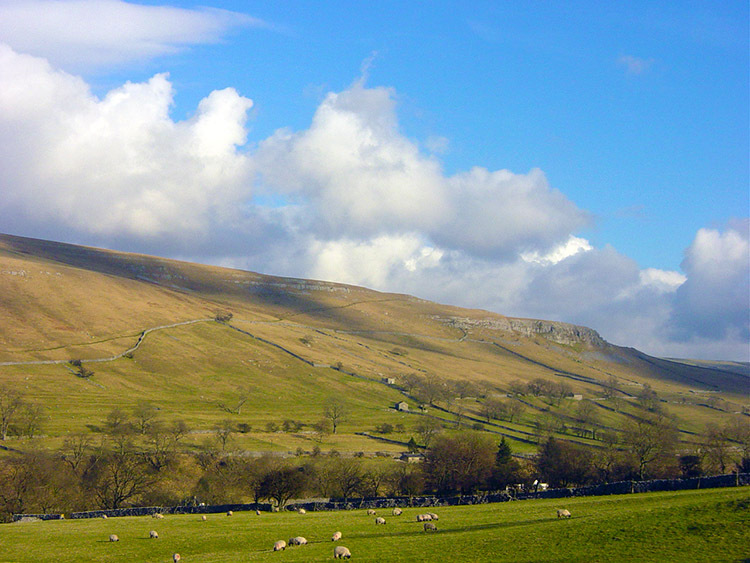 As I drove over from Leeds to Kilnsey the sky was clearing and although it was cold I looked forward to an exciting day out in the Yorkshire Dales. The low sun crept over the hills and cast eerie shadows onto the surrounding land. As it rose slowly the clouds broke some more. I was going to be walking in sunshine! I arrived in Kilnsey and quickly changed into my walking gear. Clouds can increase or wane quickly at this time of year and I wanted to walk while the going was good. I set off uphill on Mastiles Lane out of the small village and soon gained height. I looked back over to the Dales Way between Grassington and Kettlewell and gained a good distant view of Conistone Dib which is one of my favourite Dales places. I remembered my times there walking through the narrow gorge. Then I turned and focused on my walk today. Mastiles Lane beckoned me on. The first few miles are walked within the confines of impressive drystone walls as the road weaves its way over the rolling fells. The sun continued to rise slowly. Nothing it does in February is quick. Shadows were to be with me all day but it was a brilliant clear day making the shadows distinctive. When I gazed at terracing caused by limestone erosion and landslip the shadows added to the layering effect on the fells. It was stunning. I continued along the lane bobbing up and down its undulating slope until I arrived at the site of a Roman Marching Camp - I believe there was one here but I am no Time Team expert and for me there was no evidence at all. I read the interesting plaque pinned on the wall and moved on down to Gordale Beck. I paused and imagined it cascading down Gordale Scar less than a mile downstream. After my brief respite at Gordale Beck I climbed up from the groove it had shaped on the course of Mastiles Lane and on reaching the next brow I saw the road at Street Gate just ahead of me. This told me I was almost complete on my walk of Mastiles Lane. 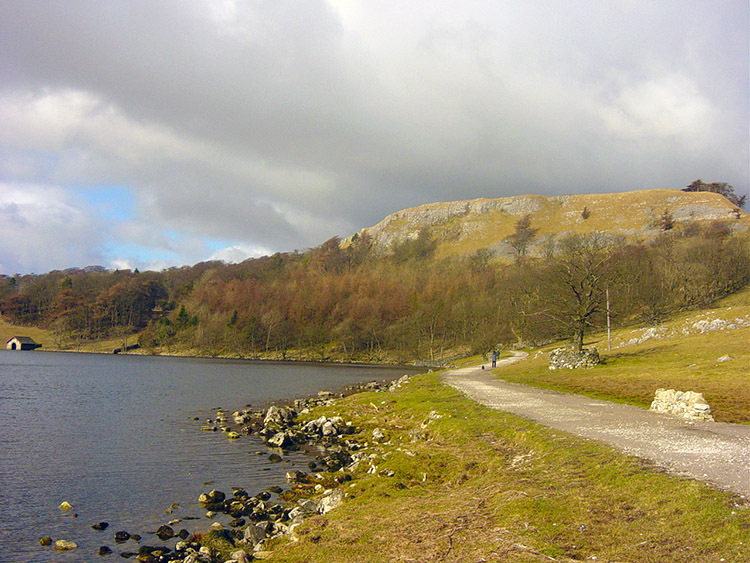 I left the old drovers road and crossed over the road to follow a path leading me to Malham Tarn. 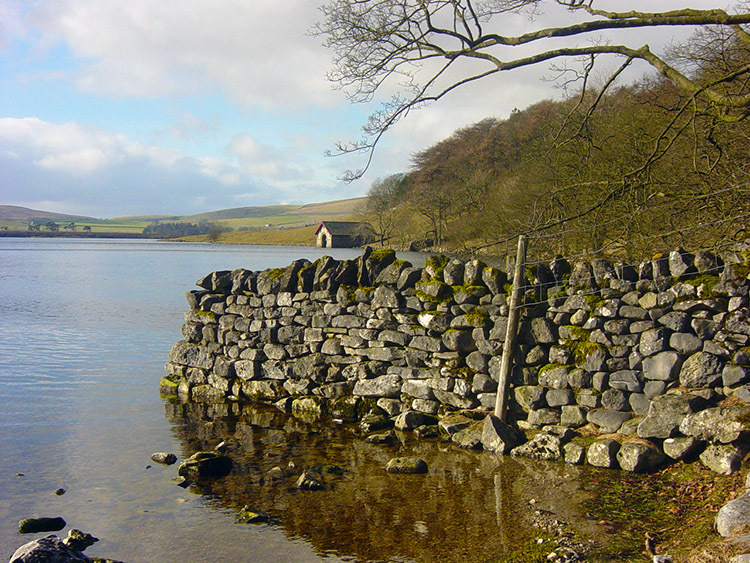 The tarn lies 375 metres above sea level and lies on a Silurian Sandstone base, trapped by hard impervious slates brought to the surface on the North Craven Fault. It is a shallow lake of 150 acres and a haven for many species of bird including Moorhen, Coot, Great Crested Grebe, Tufted Duck and Teal. Today in mid February there were many pairs of mating Moorhen relaxing on the tarn before the busy season of bringing up chicks. I sat by the Tarn for lunch and fed one nearby pair some crumbs of bread which they gobbled up generously. It was a lovely spot to have lunch and the Moorhens made it even more relaxing. Moreover, as I sat by the Tarn I gazed over to the south east where the low winter sun cast a lovely shimmering reflection on the water. I also enjoyed the warmth of the sun in my waterside shelter from the wind, it was warm here even on a cold day. It was with great reluctance that I packed up my wares and assembled myself for the journey back over Great Close and High Cote Moor. The sun was at its highest as I left Malham Tarn and I was soon sweating on the stiff climb from the waters edge over the fringes of the impressive Great Close Hill on the Monks Road towards Middle House Farm. Up and over I went into an area of the Dales I had never been in before. The remainder of the walk was going to be a discovery for me even for an area where I have walked so much. I arrived at Middle House Farm and took my bearings to track south then east to Flock Rake and High Cote Moor. 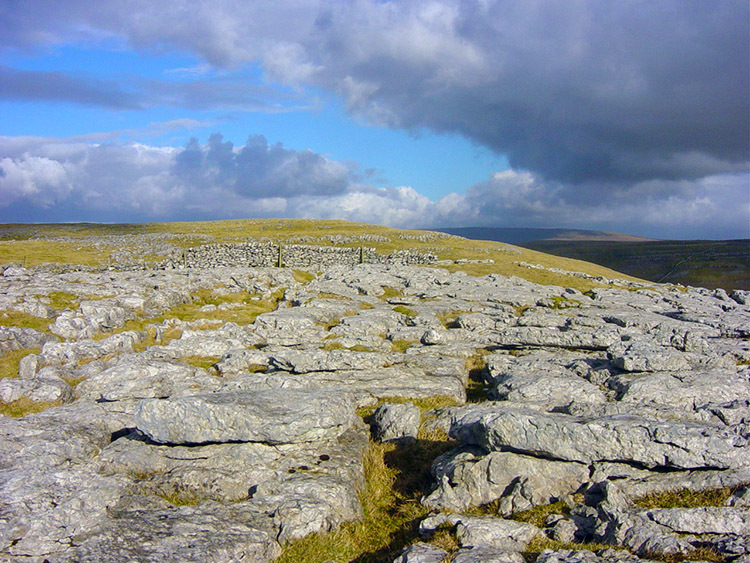 The walking was divine as I wandered over lush Dales fell and amidst scattered limestone outcrops. Occasionally I came across a limestone pavement and enjoyed a bound over the pavements while carefully avoiding the cracks between the limestone. On Flock Rake I was at the highest point of my walk at slightly over 500 metres. This was evidenced by small scatterings of snow hidden in permanent shade from the suns melt. 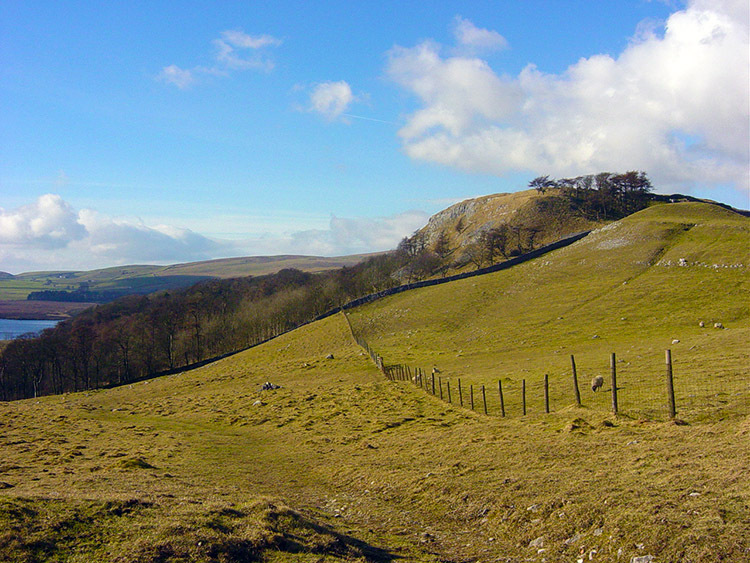 From here it was all downhill to Arncliffe Cote. It was not to be rushed though for now for the scenery was stunning and there were hidden treasures to be found. 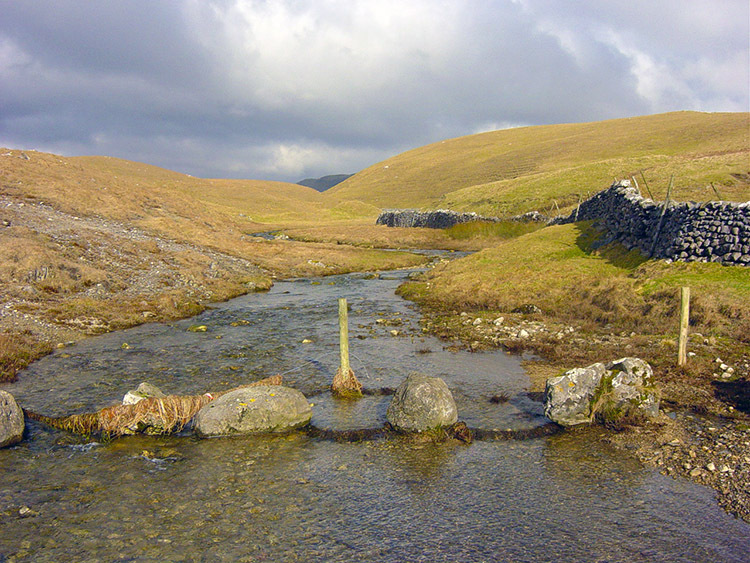 I soon reached High Cote Moor and crossed a small stream which was one of the origin sources of Cote Gill. Soon after I heard the rushing of water and even though it led me of the track I had to look for the source of the noise. I searched on, ears attentively seeking the source of the noise of falling water. After a few steps down a bank I saw the most spectacular waterfall. Not the most tremendous in the Yorkshire Dales but a lovely sheer drop of about 20 feet into a crystal blue pool. 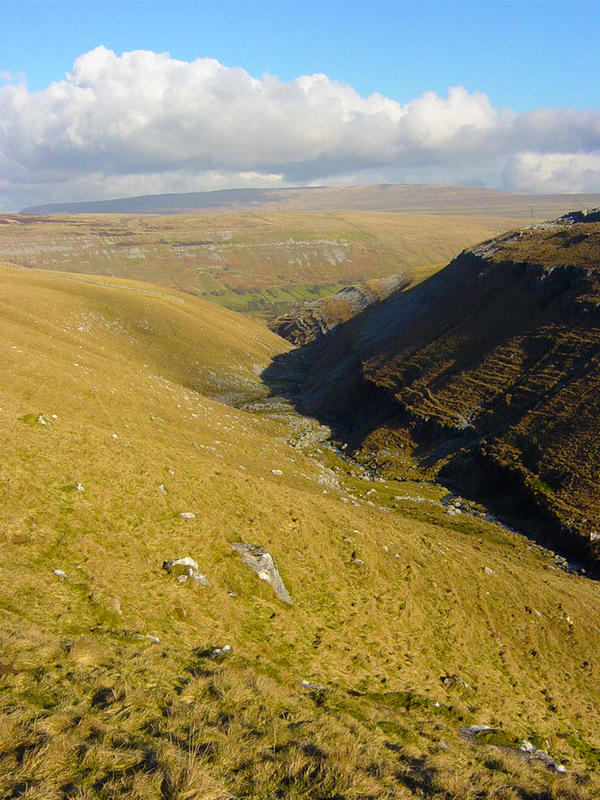 It was the largest of a series of waterfalls cutting a gorge into which Cote Gill descended. It was heaven and I stayed for a while enjoying the wonderful spectacle. It is a hidden gem that must be sought out if you are near. 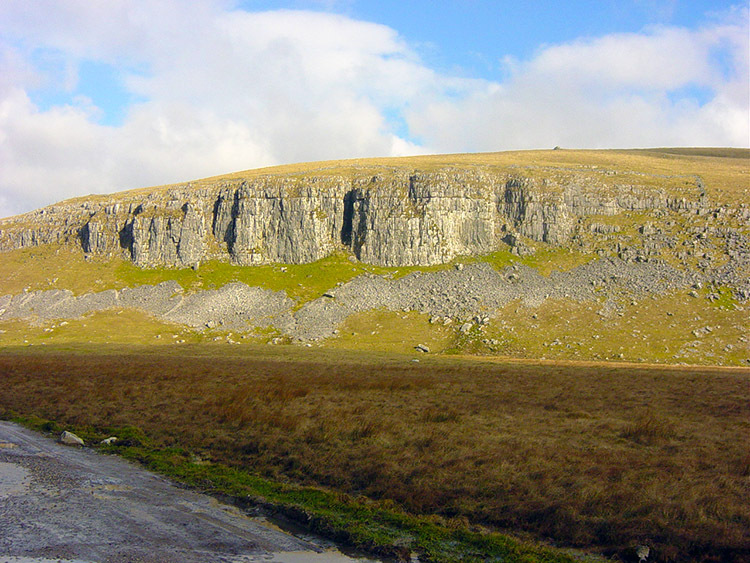 The resulting gorge cut out by Cote Gill is typical of many in the dales and it made for a special sight in the clear winter sunshine. I walked past it slowly taking glimpses down to the water and up to the far hillside where shadows were beginning to lengthen. The rippled hillside looked spellbinding with those changing shadowy shapes caused by the falling sun. I trailed down steeply soon after and it seemed no time at all before I was off the hills altogether and down in Arncliffe Cote. From Arncliffe Cote the walk was never as exciting as I was forced to follow a tarmacadam road all the way back to Kilnsey. It was a very quiet road and flat walking but I had been over satiated with spectacular scenery today and this section was pale in comparison. The views to my left of Old Cote Moor were good though and I let the hill help me along until I approached Kilnsey. Nearing Kilnsey I came up on the bottom of the irrepressible Kilnsey Crag, an awesome chunk of rock that graces the Wharfedale Valley. I gazed and gazed as I walked alongside the natural monolith, a fitting end to a super spectacular walk.